Thursday November 29, 2018 Guerneville CA. I need some tools to help do the brakes on my Toyota Land Cruiser. I would like to get a air vacuum bleeder to bleed the brakes once I get the new cylinders on so I headed for Harbor Freight as they carry them. But alas once I got in the store the spot where they were supposed to be was empty so I asked about when some more would come in, maybe in a week or two they said. I may have to use my old hand pumped vacuum bleeder instead which will work but it’s more of a pain to use. I had some other shopping in mind but most of it can wait until another time. 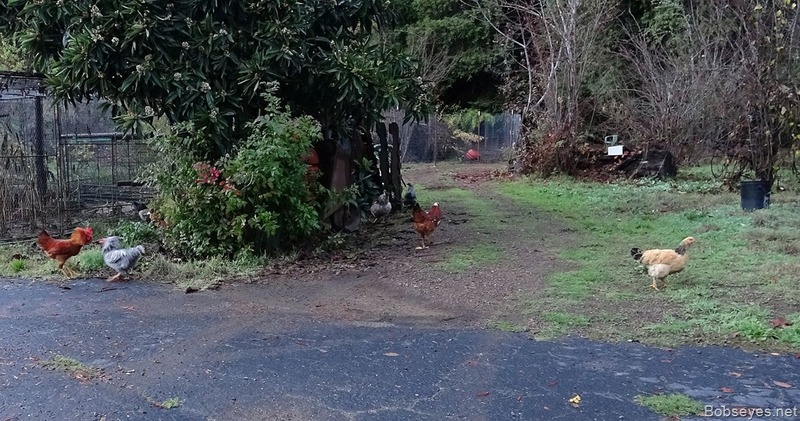 I did need to go to the feed store on the way home and get some feed for the chickens. I mainly wanted to get some milo also know as sorghum as the chickens seem to like it, but they were out of it and not planning to get any in so I asked about ordering some. Yes, maybe we’ll give you a call after we find out. I got some other seed, oats and barley and some wheat bran. They did call me after I got home and said they can get it but it’ll be a couple weeks. OK, get it and give me a call. Once home I unloaded my stuff and was going to clip side wire onto some grower panels that I cut the wire for the other day, but look as much as I could and I couldn’t find the hog clip pliers. I looked all over a couple of times with no luck. Sometimes it take me longer to find my tools than it takes to do a job. I figured I’d find them eventually so put that aside for a bit. The fire in my wood stove had gone out so I got some kindling and got it going and warmed up the house and took it easy for awhile. 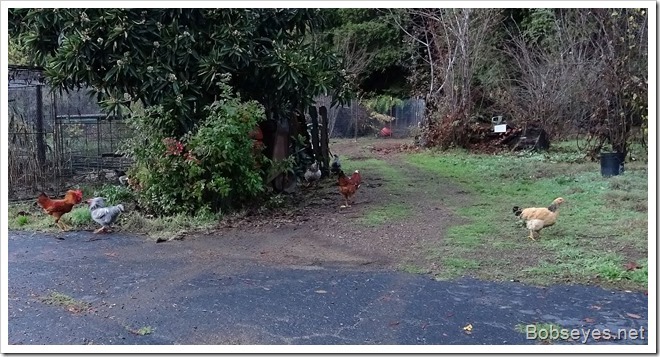 Around four I let the chickens out into the yard to graze. 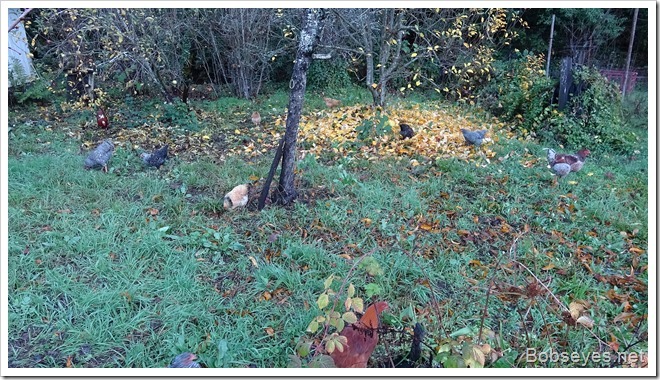 They go to the luscious spot first which is here by the raspberry patch. 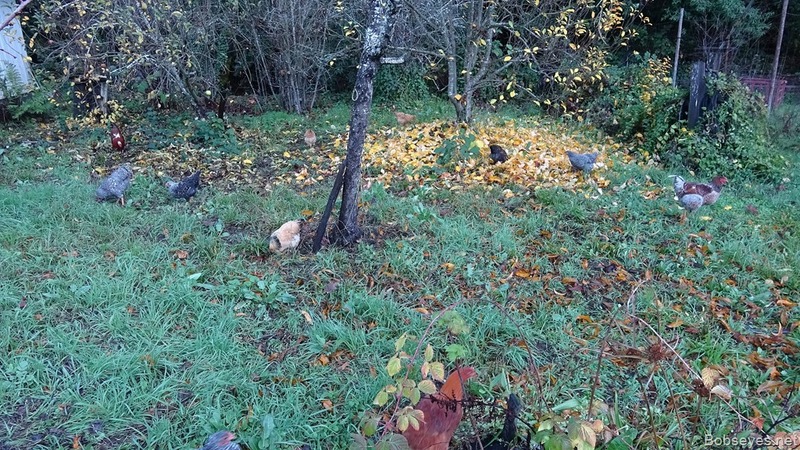 As the day starts to cool down around five they move to the front yard which is closer to their pen and they scratch around until it’s time to go to roost. 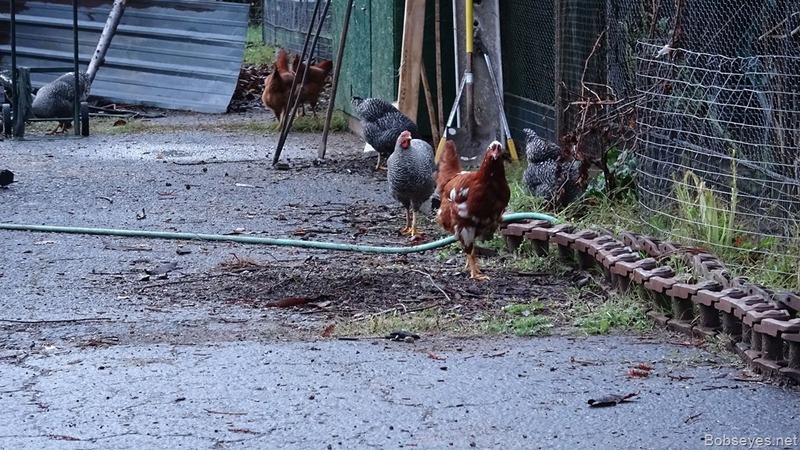 Just after five the chickens head back to the roost and dally here for a bit before going in for the night. 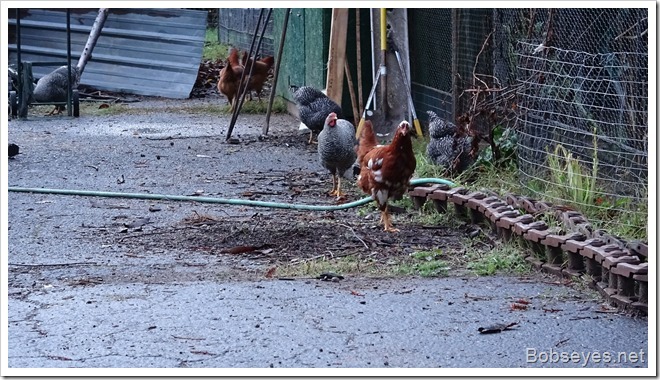 This entry was posted in Uncategorized and tagged chickens, sor. Bookmark the permalink. Seems like today was your day for needing things you didn’t have on hand. We all have days where projects have to be put on hold for one reason or another. Hopefully, the vacuum bleeder and the sorghum comes in on the same day so you can get them together. Or maybe you don’t need the bleeder now? A nice wood fireplace sounds cozy and warm. Take the dampness out of the house. Are you sure you’ll remember where your pliers are?